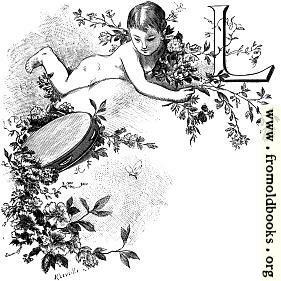 This decorative initial (drop cap) features a cherub lying on his tummy, with flowers all around him and a tambourine nearby. The piece is signed “K. Levlille” I think, for the engraver; the artist is presumably Pierre-Victor Galland, who died more than 100 years ago, so this piece is out of copyright, but you must still give the artist full credit. I could not find any details on Levlille, nor on Leveille.